It’s absolutely no secret that I’m a fan of supermarket shopping. 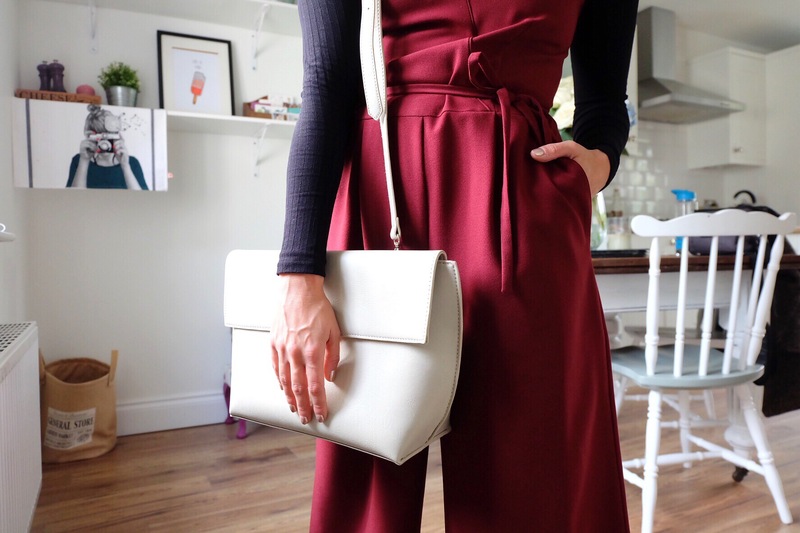 Any excuse to bag some new wardrobe pieces and I’m game – ‘Whats that dear? You’re going to the biscuit aisle? Okay BRB gonna go browse the clothes section‘. It’s the ultimate distraction from the mundane chore that is food shopping. You should totally try it some time. Okay so lets get to it. 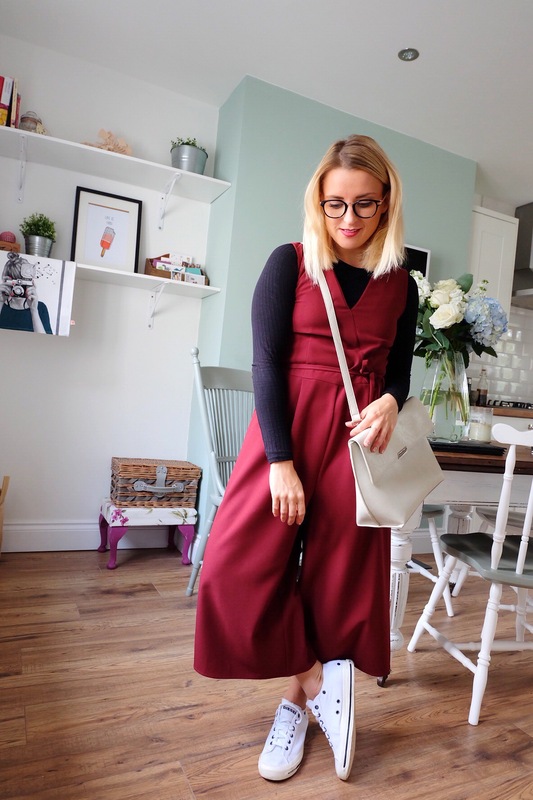 Introducing this highly versatile, burgundy, culotte jumpsuit which my Mum picked up for me from Sainsburys. Big ol’ round of applause, you so got this Tu Clothing. 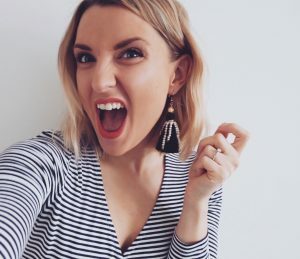 Just to prove to you why spending £18 on this little honey is totally worth it, I’ve styled it two ways. (And yes, I did say £18. Like you need any persuasion with that minuscule price tag). This look is totally perfect for lunch dates with your mates or Saturday shopping trips with bae. The layering here is key; it takes it from snazzy evening outfit to laid back llama in a few simple steps. In actual fact, layering is my answer to everything at the moment – wanna re-wear that summer sleeveless shirt? Stick a long sleeved top under it. Wanna wear that slip dress out on a chilly autumn evening? Stick a long sleeved, thin roll-neck under it. Still got an urge to wear your pleated midi out into the chilly air? Bundle a thick knit over the top of it.  You get the picture right? 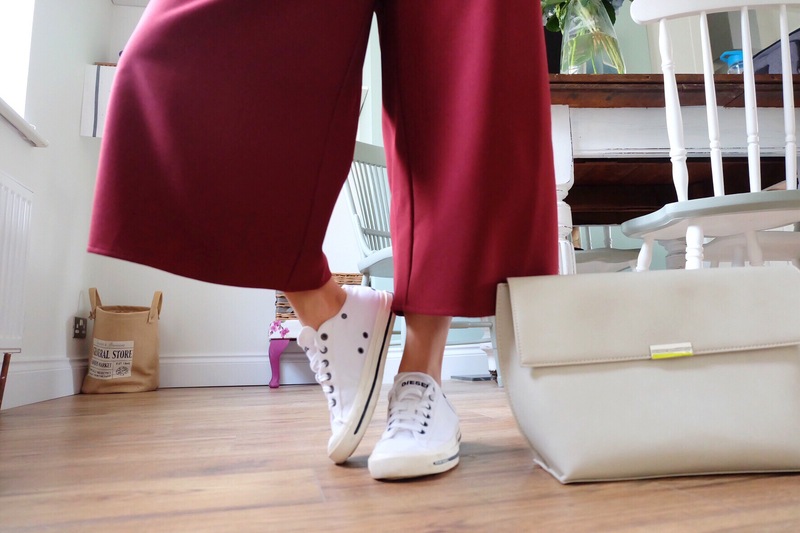 Don’t be afraid to wear flats with culottes. It gives an outfit an untouchable laid back vibe. 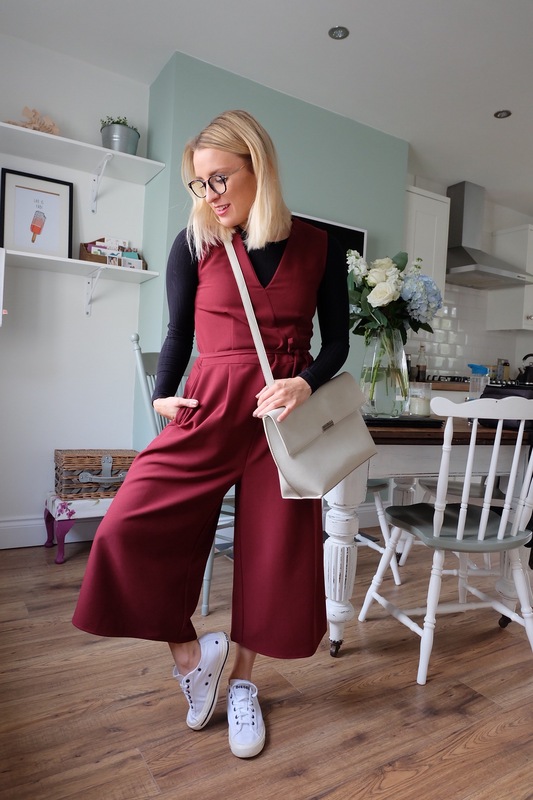 And basically it’s the most comfortable way to dress (believe me, I wear culottes and flats most days to work – it’s the next step up from onesie comfort). 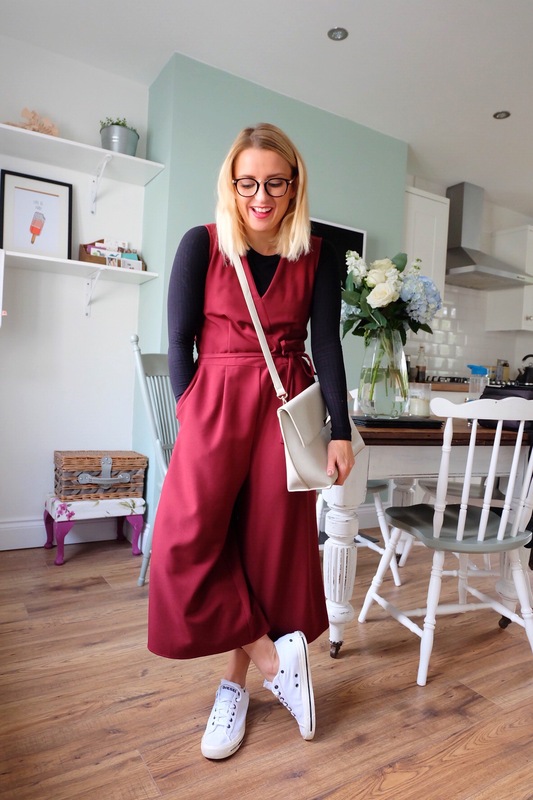 Culottes Jumpsuit – TU Clothing (I swear yesterday when I looked it was still in the sale and now it’s not. Bizarre). You can also find some similar versions here & here. The ‘cocktail’ look is far easier to recreate and one I’m sure you’re all familiar with. Basically, whip off the underneath layers, slip into your slickest court shoes and grab the most sparkly clutch bag you own. All things sequin & sparkle are ‘in’ this season so go wild ladies. I’m ticking two trends off with the sequin leopard print clutch which is an old fave from RI. 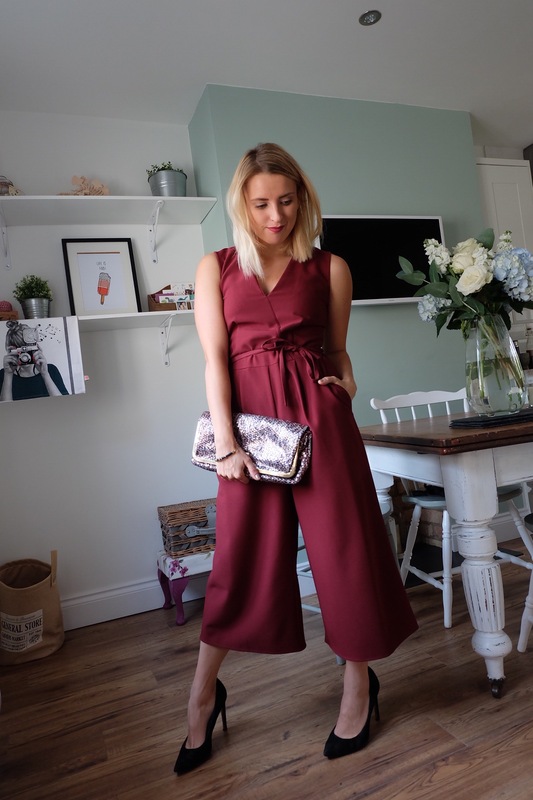 The best thing about this jumpsuit? It’s roomy. So yes, I can drink all the Gin Brambles & Pornstar Martinis without feeling like I’m gonna bust out my outfit like Vilolet Beauregarde. There might even be room for some late night chips on the way home, and I’d still feel fabulous. Cheeky. 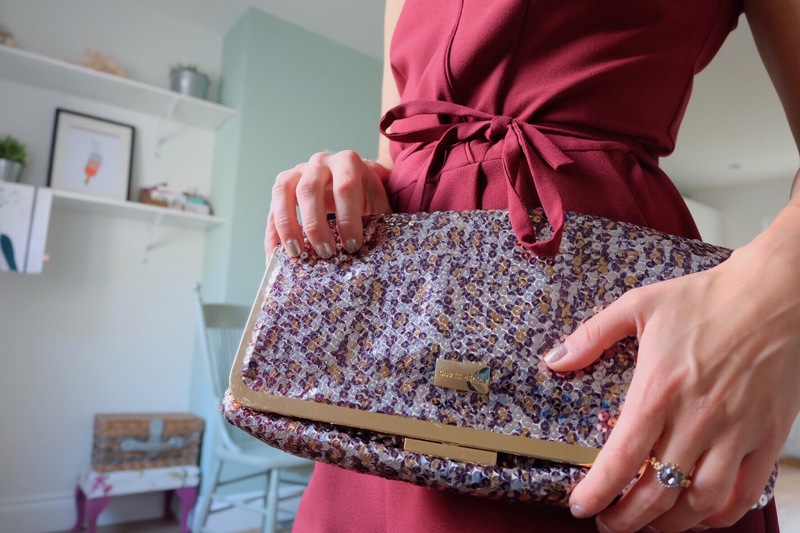 Sequin clutch bag – River Island (not available anymore, but I’m gonna bring this cutie up again because I want this sequin clutch so so much). To summarise; make your wardrobe versatile. Don’t put outfits in a box (casual/work/play) because everything can be changed up and re-worn differently.